On the eve of an election for the Lok Sabha, India’s national parliament, Indians are disgruntled about the state of their nation, deeply worried about a range of problems facing their society and supportive of new leadership in New Delhi. However, despite a faltering economy, they remain fairly upbeat about their personal finances and hopeful about the economic prospects of both India and the next generation. Notwithstanding recent high-profile official frictions with the United States, the Indian public has a generally positive view of America. Meanwhile, Indians are divided in their opinions about the world’s rising superpower: China. And they remain deeply wary of Pakistan, although they would like to see Indo-Pakistani relations improve. More than twice as many Indians are dissatisfied as satisfied with the way things are going in the country (70% vs. 29%). And this discontent is shared by those who would like to see the Hindu-nationalist opposition Bharatiya Janata Party (BJP) lead the next Indian government, those who prefer the current governing coalition led by the left-of-center Indian National Congress (Congress) party and those who favor some other party to lead. Despite a dramatic slowdown in economic growth in the last few years, more than half (57%) still describe the country’s economic performance as at least “somewhat good.” And nearly two-out-of-three (64%) expect the nation’s children to be better off as adults than people are today. But as Indians head to the polls, there is pervasive, intense concern about a range of current economic troubles. By overwhelming majorities they say inflation, joblessness and inequality are not just problems for the country, but very big problems. In the face of these challenges many Indians voice despair. Nearly two-out-of-three lament the political and parliamentary deadlock that hobbles national problem solving. And by overwhelming margins, Indians say corruption by public and business officials – those whom citizens might look to for solutions– is a significant problem. Little wonder then that only about four-in-ten Indians retain a lot of confidence in either the national government or the Lok Sabha. Looking ahead, by more than three-to-one (63% to 19%) Indians prefer the BJP, not Congress, to lead the next government. Such sentiment is in no small part due to the belief by more than two-to-one that the BJP would do a better job dealing with India’s myriad problems. (For more on views of the two parties, as well as Indian political leaders, see this Pew Research Center report from February 26, 2014). Domestic conditions largely shape the public mood in the run-up to the election. But India is the world’s second most populous country and the 10th largest economy, making it a major player on the world stage. Indians’ views of the international challenges they face and their nation’s role in the world are a notable aspect of Indian public opinion. During the Cold War, the Indian government attempted to position itself between Moscow and Washington by claiming leadership of the non-aligned movement. India again finds itself in a world, and in a region, with two preeminent powers: China and the United States. And the Indian public is fairly clear where its sentiments lie: with America. By 56% to 15%, Indians express a favorable, rather than unfavorable, view of the United States, with 28% offering no opinion. Meanwhile, Indians are roughly divided in their attitude toward China (35% favorable vs. 41% unfavorable). And, by a margin of 21 percentage points, they are more positively disposed toward the United States then they are toward China. By nearly four-to-one (47% to 12%) Indians say the United States is today the world’s leading economic power rather than China. However, a third of Indians say China has already replaced or will eventually replace the United States as the world’s leading superpower, possibly a reflection of Beijing’s growing strategic as well as economic influence. Yet Indians are less likely than publics in many countries to see China’s rising hegemony as inevitable, according to a separate Pew Research Center survey in spring 2013. Bilaterally, Indians are more than twice as likely to see America as a partner than as an enemy. They are more likely than not to see China as an enemy, whose rising power and influence more than half of Indians view as a major threat to the country. And Indians are much more likely to favor strong ties with Washington than to support more robust relations with Beijing. Such sentiment in favor of the United States exists despite the fact that the Pew Research Center survey was in the field in India during and in the immediate aftermath of the controversial December 12, 2013, arrest and strip-search of India’s female deputy consul general in New York on charges of visa fraud. This may be one reason that Indians are divided over whether relations between India and the United States have improved in recent years. Meanwhile, Indian views of the international challenges facing the country are inextricably bound up with its neuralgic relationship with Pakistan, which New Delhi claims gives safe haven to anti-India terrorist organizations. Nearly nine-in-ten Indians say terrorism is a very big problem for the country, two-in-three voice the opinion that Islamic extremist groups are a major threat to India and roughly six-in-ten are worried that such groups could take control of Pakistan. Overall, just 19% of Indians express a positive view of Pakistan. And when asked which poses the greatest threat to India – Pakistan, China, the Lashkar-e-Taiba extremist group or Naxalite insurgents – a 47%-plurality chooses Pakistan. 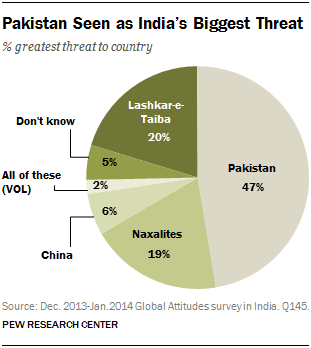 Still, most Indians hope for a stronger relationship with Pakistan. A majority (64%) would like to see improved relations with India’s long-running rival, and more than half support more trade and more talks between the two nations.